Dark spot correction from SkinCeuticals, Yes To Grapefruit and Luminaze! Ready to rid yourself of the dark spots and patches currently marring your pretty little face? Here's a few products that are up to the job! SkinCeuticals Advanced Skin Discoloration Corrector - 30ml - $104 - works on all skin ethnicities to correct and prevent unwanted pigmentation on multi-layers of the skin by exfoliating on the surface with salicylic acid; inhibiting melanin transfer at the epidermis wth hydroxyphenoxy propionic acid; blocking excess melanin production at the basal layer with ellagic acid; and strengthening dermal layers to prevent against new and reoccurring pigment with yeast extract. 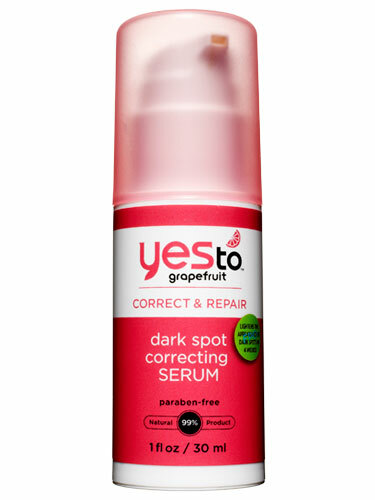 Yes To Grapefruit Correct & Repair Dark Spot Correcting Serum - 30ml - $20.99 - harnesses the power of highly concentrated grapefruit to even skin tone, increase luminosity and improve skin's natural radiance along with white tea - an excellent anti-inflammatory and a rich source of vitamins C & E.
Luminzaze Catalytic Skin Tone Illuminator and Dark Spot Corrector - 30ml - $132 - this two-step treament helps visibly diminish excess pigmentation in the skin to help quickly and safely reduce the appearance of dark spots and age spots to help reveal a visibly brighter, more radiant, even skin tone. Contains an enzyme harvested from a mushroom that grows on trees high in the Swiss Alps. It was noticed that the bark surrounding these mushrooms was decolourized. The same properties that were found by researchers to lighten the colour of the bark, result in helping the skin for a dramatic improvement in the appearance of dark spots from sun and aging. Free of hydroquinone and fragrance, and is hypoallergenic and non-comedogenic. It would be a shame to pay all this money just to have the spots and discoulouration come right back so make sure you wear a moisturizer with sunscreen - every day, even when it's cold and doesn't feel like the sun is even out!